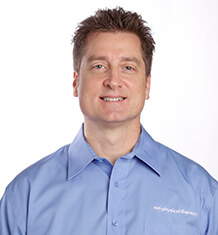 Jim Rivard is the founder, co-owner and President of MTI Physical Therapy. Four years of post-graduate training specializing in orthopaedic manual therapy has made him an expert in a wide range of orthopaedic issues: sports rehabilitation, post-surgical rehabilitation, spinal injury, headache, TMJ disorders, work injury and motor vehicle collision. His passion for learning and development of clinical skill culminated in the establishment of MTI Physical Therapy as a teaching clinic for post-graduate training. His clinical achievements have been recognized with the attainment of Fellow in the AAMOPT in 1995 and a Board Certified Orthopaedic Clinical Specialist in 1997. He has been honored to currently serve as the President for the American Academy of Orthopedic Manual Physical Therapy, recognized internationally as the primary organization for manual therapy in the United States. In addition to a clinical practice, Jim Rivard has extensive experience teaching and lecturing on manual therapy and exercise. He has been an instructor for the Ola Grimsby Institute (OGI) since 1992. In 2013 he, along with two associates, has assumed an operational role for the OGI as its Chief Academic Officer. His extensive teaching experience has been shared in more than 250 courses throughout the United States and Internationally in eleven countries. Jim’s post-graduate training has included 1 and 2-year Residency and Fellowship programs leading to masters and doctorate degrees. In 2016, Jim Rivard, received the Physical Therapy Association of Washington (PTWA) Award for Clinical Excellence! This award is presented to an individual who has been engaged in clinical practice for at least ten years and has made outstanding and long lasting contributions to the clinical practice of physical therapy. To add to the fun, our very own Robin Schoenfeld, one of our Magnolia Clinic Managers and Vice President of PTWA, presented the award to Jim along with the President of the American Physical Therapy Association (APTA), Sharon Dunn. California Physical Therapy Association, State Chapter meeting, Oct 2014. Idaho Physical Therapy Association, State Chapter meeting, Oct 2013. American Academy of Physical Therapy Annual Conference (AAPT) Charlotte, NC, 2011. North American Institute of Orthopaedic Manual Physical Therapy (NAIOMPT) Portland, Oregon, 2006. 3rd World Congress of the International Society of Physical and Rehabilitation Medicine. Sao Paulo, Brazil, 2005.
de Symposium Sportletsels. (Simposium on Sports Medicine) Antwerp, Belgium in 1998. APTA Combined Section Meeting. Boston, Massachusetts, 1998.
International Federation of Orthopaedic Manipulative Therapists (IFOMPT), Lillehammer, Norway, 1996. State Chapter conferences: Washington (1998), Alaska (1997/2009), Florida (1995) and Louisiana (2009). The 5th Annual Mid-American Sports Medicine Conference: The Institute for Preventative Sports Medicine. Dearborn, Michigan, 1997. Grand Valley State University (1995), University of Kansas (1999), and University of Puget Sound (2004/2005). Ola Grimsby Institute Annual Competency Forum (1993, 1994,1996 and 2001). Seattle Orthopedic Special Interest Group (1995). Other invitations have included private practice clinics and corporations. The 1995 “Hallvard” from the Ola Grimsby Institute. Given for excellence- in teaching, sharing of knowledge, skills and self- to facilitate and motivate others as both teachers and students. Science, Theory and Clinical Application in Orthopaedic Manual Physical Therapy: Applied Science and Theory (Volume 1, 2008). Science, Theory and Clinical Application in Orthopaedic Manual Physical Therapy: Scientific Therapeutic Exercise Progressions: The Neck and Upper Extremity (Volume 2: 2008). Science, Theory and Clinical Application in Orthopaedic Manual Physical Therapy: Scientific Therapeutic Exercise Progressions: The Back and Lower Extremity (Volume 3: 2009). Author and developer for the Manual Therapy Exercise Kit: www.VHIkits.com, an exercise program for physical therapists to produce exercise documents and home exercise programs. Currently involved in joint research with the OGI and the Cleveland clinic for measurement of blood flow with exercise, ocular training for cervical and concussion rehabilitation. Eccentric work as related to percentages of one isometric maximum. Pilot study completed August of 1993. Poster Presentation Repetitions versus percentage of a one isometric maximum [1 IM] for eccentric shoulder external rotation. International Federation of Orthopaedic Manipulative Therapists, 6th International Conference, Lillehammer, Norway, April 21-26, 1996. Rivard J, Unsleber U, Schomacher J, Erlenwein J, Petzke F, Falla D. Activation of the semispinalis cervicis and splenius capitis with cervical pulley exercises. Musculoskeletal Science and Practice 30 (2017) 56-63. Rivard J, Grimsby O. Exercise Dosage and Design for Cervical Rehabilitation. Manuelle therapie (German). 17:14-18, 2013.